From creating, copying and selecting layers to blend modes, clipping masks and more, learn how to speed up your Photoshop workflow with these essential layers shortcuts! When it comes to getting the most out of Photoshop with the least amount of effort, there are two things we absolutely need to know—how to use layers, and how to use keyboard shortcuts. Layers keep our work flexible, while keyboard shortcuts help us complete our goals as quickly as possible. In this tutorial, I've combined the two and rounded up Photoshop's essential keyboard shortcuts for working with layers! Learning these powerful shortcuts will increase your productivity, and they'll boost your confidence as you take a giant leap forward on the road to Photoshop mastery! This updated version of the tutorial is for Photoshop CS6 (which is what I'll be using) and is fully compatible with Photoshop CC. 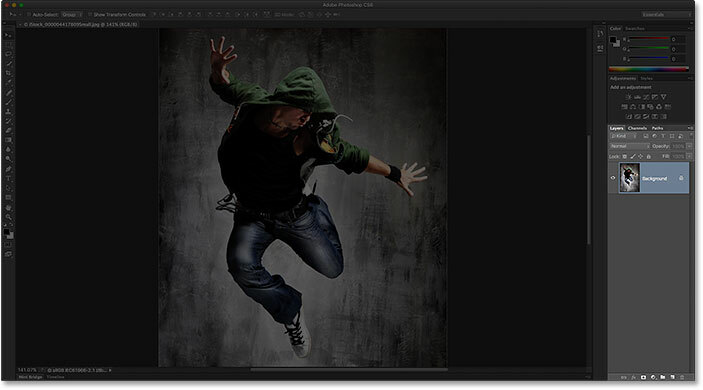 If you're using Photoshop CS5 or earlier, you'll want to check out the original version of this tutorial. Let's get started! 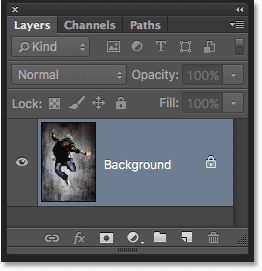 This tutorial is Part 10 of our Photoshop Layers Learning Guide. 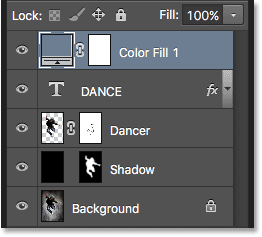 The Layers panel opens in the lower right of Photoshop's interface. A closer view of the Layers panel. 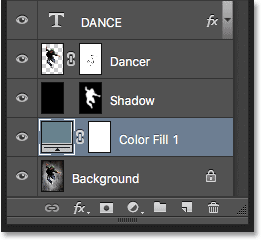 Photoshop's generic layer names are not very helpful. Holding Alt (Win) / Option (Mac) while clicking the New Layer icon. Giving the layer a more descriptive name. The new layer appears with the custom name. We can also create new layers directly from the keyboard without needing to click the New Layer icon at all. To create a new layer from your keyboard, press Shift+Ctrl+N (Win) / Shift+Command+N (Mac). 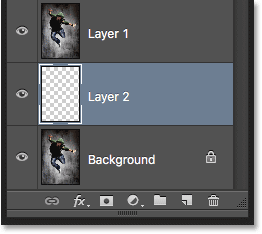 Photoshop will pop open the New Layer dialog box so you can give the layer a descriptive name. If you don't care about the layer's name, press Shift+Ctrl+Alt+N (Win) / Shift+Command+Option+N (Mac) on your keyboard. 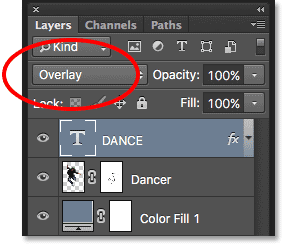 This will bypass the New Layer dialog box and simply add the new layer with one of Photoshop's generic names (like "Layer 2"). Making a copy of the Background layer by pressing Ctrl+J (Win) / Command+J (Mac). 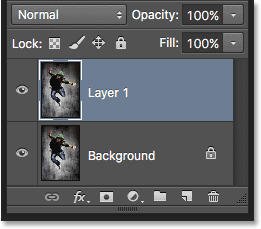 To copy and move a layer at the same time, first select the layer you need in the Layers panel. Then press the letter V on your keyboard to select the Move Tool. Press and hold your Alt (Win) / Option (Mac) key as you click and drag on the layer in the document to move it. Rather than moving the original layer, you'll move a copy of the layer while the original stays in place. Holding Ctrl (Win) / Command (Mac) while clicking the New Layer icon. The new layer appears below the layer that was previously selected. Pressing Ctrl+Alt+A (Win) / Command+Option+A (Mac) to select all layers (except the Background layer). Another way to select multiple layers that are all directly above or below each other is to press and hold Shift+Alt (Win) / Shift+Option (Mac) and use the left and right bracket keys ( [ and ] ) on your keyboard. The right bracket key will add the layer above the currently selected layer to your selection. Continue pressing it to move up the layer stack and select more layers. The left bracket key will add the layer below the currently selected layer. Press it repeatedly to move down the layer stack adding more layers. To scroll through the layers in the Layers panel, press and hold Alt (Win) / Option (Mac) and use your left and right bracket keys ( [ and ] ). The right bracket key scrolls up through the layers; the left bracket key scrolls down. To move the selected layer up or down the layer stack, press and hold Ctrl (Win) / Command (Mac) and use your left and right bracket keys ( [ and ] ). The right bracket key moves the layer up; the left bracket key moves it down. Note that this does not work with the Background layer since you can't move the Background layer. 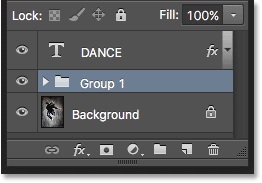 Also, you won't be able to move any other layers below the Background layer. Jumping the selected layer to the top of the stack. 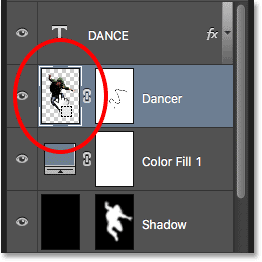 Jumping the selected layer to the bottom of the stack (above the Background layer). 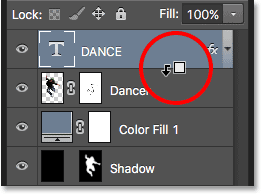 Click the visibility (eyeball) icon to toggle a layer on or off. What you may not know is that you can temporarily hide every layer except for that one layer by pressing and holding your Alt (Win) / Option (Mac) key as you click the visibility icon. Notice that the eyeball is now visible only for my "Dancer" layer, which tells us that every other layer in the document is now hidden. Only that one layer remains visible. To turn all the layers back on, once again press and hold Alt (Win) / Option (Mac) and click the same visibility icon. Alt-clicking (Win) / Option-clicking (Mac) toggles all other layers on and off. One very helpful trick many people don't know about is that after you've Alt-clicked (Win) / Option-clicked (Mac) on a layer's visibility icon to hide all layers except for that one layer, you can then scroll through your layers, showing them one at a time, by keeping your Alt (Win) / Option (Mac) key held down and pressing the left and right bracket keys ( [ and ] ). The right bracket key will scroll up through the layers; the left bracket key will scroll down. As you arrive at each new layer, Photoshop will make that layer visible in the document and leave all the others hidden. 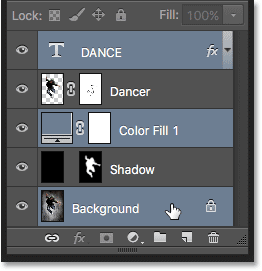 This makes it easy to scroll through your layers and see exactly what's on each one. Holding Ctrl (Win) / Command (Mac) and clicking on the layer's preview thumbnail. To select the entire layer itself, not just its contents, first click on the layer to make it active, then press Ctrl+A (Win) / Command+A (Mac) on your keyboard. Selecting the layers to place inside the group. Press Ctrl+G (Win) / Command+G (Mac) to group layers. 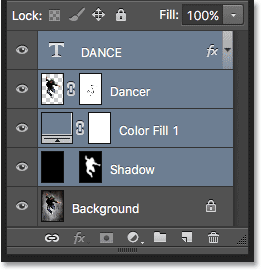 To merge a layer with the layer directly below it in the Layers panel, press Ctrl+E (Win) / Command+E (Mac). To merge multiple layers together, first select the layers you want to merge, then press Ctrl+E (Win) / Command+E (Mac). To merge two or more layers onto a new layer while still keeping the original layers, first select the layers you want to merge, then press Ctrl+Alt+E (Win) / Command+Option+E (Mac). To merge all layers and flatten the image onto a single layer, press Shift+Ctrl+E (Win) / Shift+Command+E (Mac). To merge all layers onto a new, separate layer and keep the originals, press Shift+Ctrl+Alt+E (Win) / Shift+Command+Option+E (Mac). With Alt (Win) / Option (Mac) held down, your mouse cursor will change into a clipping mask icon. 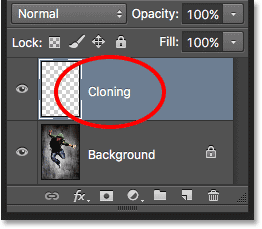 Another way to create a clipping mask is to first select the layer that should be clipped to the layer below it. Then press Ctrl+Alt+G (Win) / Command+Option+G (Mac) on your keyboard. Pressing the same shortcut again will release the mask. 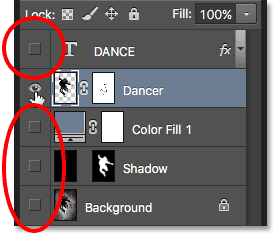 When trying to decide which layer blend mode to use, most people choose one from the Blend Mode drop-down list in the top left corner of the Layers panel to see what effect it has on their image. Then, they choose a different one from the list to view the effect. Then then they choose another, and another, and so on. There's a much better way. To easily cycle through Photoshop's layer blend modes and preview the results, press and hold your Shift key and use the plus ( + ) and minus ( - ) keys on your keyboard. The plus key scrolls down through the list; the minus key scrolls up. Hold Shift and use the plus and minus keys to cycle through the blend modes. You can also jump to specific blend modes from the keyboard. For a complete list of blend mode shortcuts, check out our Layer Blend Modes Essential Keyboard Shortcuts tutorial. 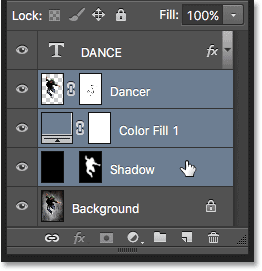 Select a layer in the Layers panel, then type a number to change the its Opacity value. You don't technically need to have the Move Tool selected for this shortcut to work, but you do need to have a tool selected that does not have its own independent Opacity option (otherwise you'll change the tool's opacity, not the layer opacity). The Move Tool does not have its own Opacity option, and since it's located at the top of the Tools panel, it's the easiest to select. We can also change a layer's Fill value from the keyboard in much the same way. 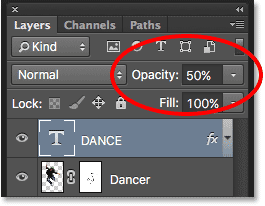 The Fill option is located directly under the Opacity option, and like Opacity, Fill controls the transparency of a layer. The difference between them is that Opacity controls the transparency level for both the contents of the layer and any layer styles applied to it, while Fill ignores any layer styles and affects only the layer's actual contents. 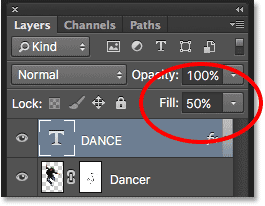 See our Layer Opacity vs Fill tutorial for more details. Hold Shift and type a number to change the Fill value. 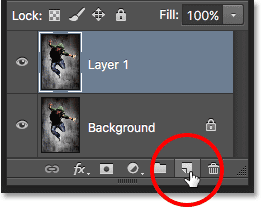 Finally, to delete a layer, rather than dragging it down onto the Trash Bin at the bottom of the Layers panel, just press Backspace (Win) / Delete (Mac) on your keyboard. And there we have it! That's our roundup of the essential shortcuts for working quickly and efficiently with layers in Photoshop! Looking for more Photoshop tips? Download our tutorials as print-ready PDFs and get our member-exclusive 101 Photoshop Tips & Tricks PDF! 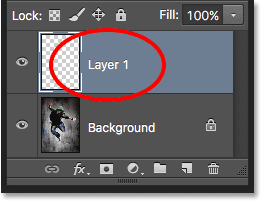 Or, check out our Photoshop Layers Learning Guide section for more layers tutorials!